In what appears to be the world's first quantum satellite transmission, China has successfully sent an "unbreakable" code over a long distance from an orbiting satellite to the Earth, achieving a milestone in the next generation encryption based on "quantum cryptography." In August last year, China launched the world's first quantum communication satellite into the Earth’s orbit aboard a Long March-2D rocket to test the fundamental laws of quantum mechanics at space. Dubbed Quantum Science Satellite, nicknamed Micius or Mozi (Chinese: 墨子), the satellite was designed to establish a 'Hack-Proof' communications system in this age of global surveillance by transmitting unbreakable encryption keys from space to the ground. Now, it has been reported that using this satellite, the Chinese scientists at the Quantum Experiments at Space Scale (QUESS) project were able to send secret "quantum key distribution" (QKD) data by beaming photons from the space to the ground stations over longer distances than ever before. The Chinese scientists successfully sent quantum keys over a distance of 1,200 Km (745 miles) from space to Earth at a transmission rate up to 20 of magnitudes more efficient than that expected using an optical fibre of the same length, lead scientist Pan Jianwei told the official Xinhua news agency. "That, for instance, can meet the demand of making an absolute safe phone call or transmitting a large amount of bank data," Jianwei said. 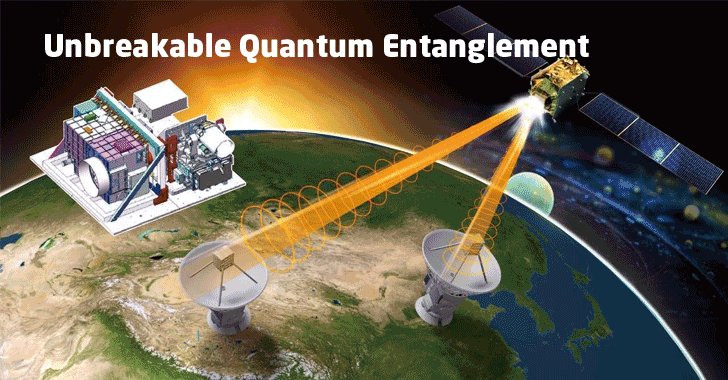 The Quantum Science Satellite could become the world's first transcontinental quantum key distribution network of its kind and China hopes to erect a global quantum cryptography-based communications network in 2030. Theoretically, the use quantum cryptography for encryption is secure against any interception, as the information is encoded in a quantum particle in a way that it'll be destroyed as soon as the system detects any intrusion attempts. "Satellite-based quantum key distribution can be linked to metropolitan quantum networks where fibres are sufficient and convenient to connect numerous users within a city over 100 km," Jianwei said. "We can thus envision a space-ground integrated quantum network, enabling quantum cryptography- most likely the first commercial application of quantum information- useful at a global scale." China has largely been ambitious to realise the importance of Quantum technology that's believed to be a new era of faster and more powerful super computers. From past two decades, Quantum technology has been a top strategic focus in China's 5-year economic development plan. While the U.S. invested about $200 Million a year in quantum research, China spent $101 Billion in quantum physics in 2015.